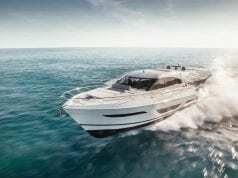 Sea Ray’s L650 Fly pushes the boundaries of technology and style for a new class of yachts. As one of the world’s most recognizable boat brands, Sea Ray has helped millions of people enjoy the water for decades. 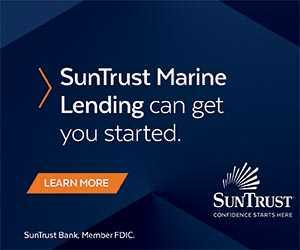 Founded in 1959, Sea Ray has expanded its model lineup over the years to serve owners of recreational boats large and small, from freshwater lakes and rivers to open oceans. 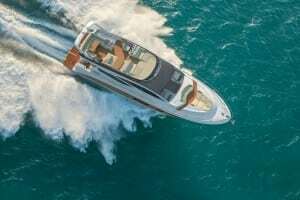 Now the builder has launched its flagship of the new L-Class of yachts, the Sea Ray L650 Fly. As the largest vessel in the Sea Ray lineup, the L650 Fly is small enough to be handled by an owner operator yet is built with the option of adding crew quarters for a captain and mate. No matter who pilots the yacht, the L650 Fly is designed for ease of operation, with an abundance of high-tech features that aid the captain and crew while running, at rest or around the docks. The L650 Fly is powered by twin Caterpillar C18A 1,150-hp diesel engines. 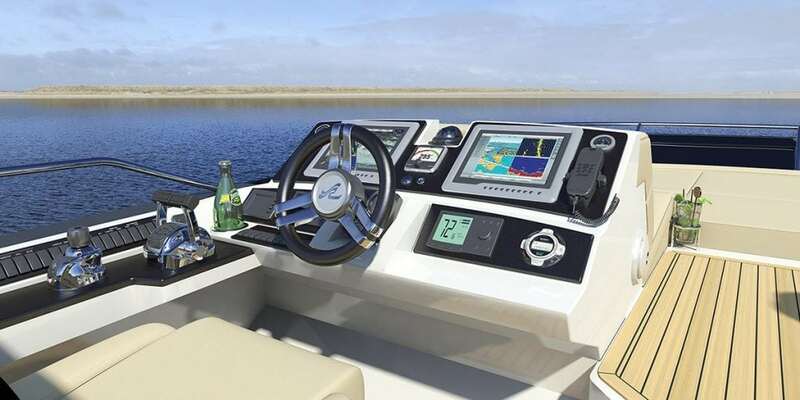 A lower helm station on the main deck and a flybridge helm station both feature—in addition to standard helm equipment—two large Raymarine multi-function displays that offer a plethora of configurations to display engine performance and other ship data. 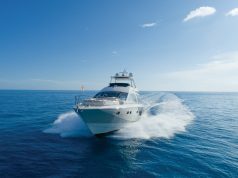 While at rest, twin Seakeeper gyrostabilizers to port and starboard in the engine room take the roll out to make guests more comfortable. In fact, everything about the L650 Fly has been designed to enhance comfort for passengers. For example, a hydraulic swim platform lowers nearly two feet into the water to make reboarding easy after a swim or launching a tender. The cockpit is accessed via either port or starboard stairs from the swim platform, and an optional passerelle can be added to the port side. So if the passerelle is extended, you still have access to the cockpit from the starboard stairs. Staterooms to port and starboard each feature twin berths and share a dayhead—side windows connect guests to the sea and again, allow in plenty of light. The VIP stateroom in the bow offers a queen berth with private head. The flybridge area is accessed via a port-side staircase and offers a variety of sunpad setups, couches and seats for relaxing. 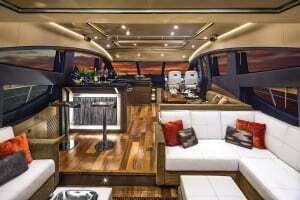 Covering the flybridge is a unique hardtop that can be configured for maximum or minimal shade. 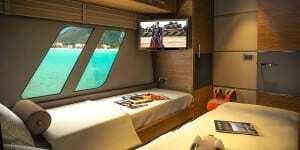 Staterooms to port and starboard each feature twin berths and share a dayhead—side windows connect guests to the sea and again, allow in plenty of light. 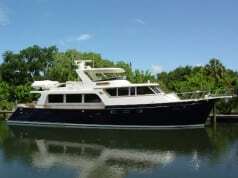 The full-beam queen master is located midship aft of the companionway. As the largest vessel in the Sea Ray lineup, the L650 Fly is small enough to be handled by an owner operator. Shower fixtures are on par with those found in fine homes. The cockpit is accessed via either port or starboard stairs from the swim platform, and an optional passerelle can be added to the port side. So if the passerelle is extended, you still have access to the cockpit from the starboard stairs. The spacious galley offers outstanding views to port. The interior entertainment area can accommodate many guests. The dining area to starboard keeps the entertaining within convenient access to the galley. 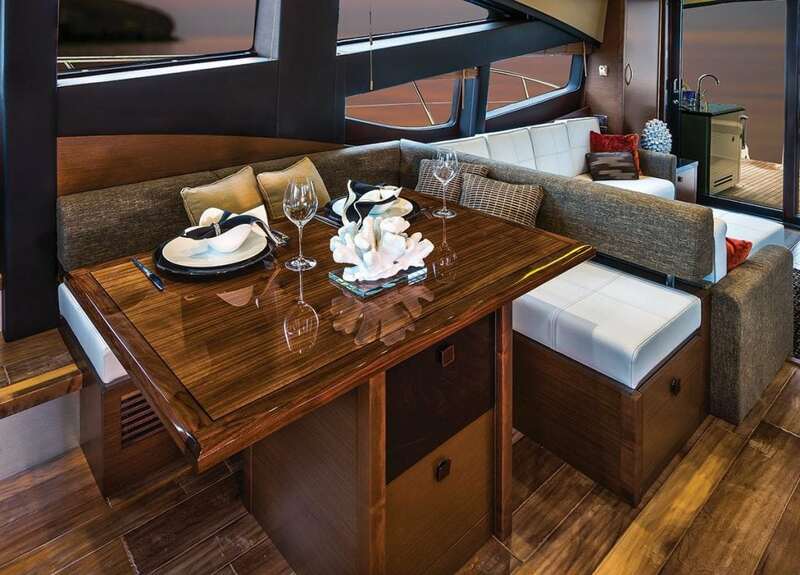 The cockpit offers an expansive social zone that features transom seating, a teak table, refrigerator, and plenty of storage. 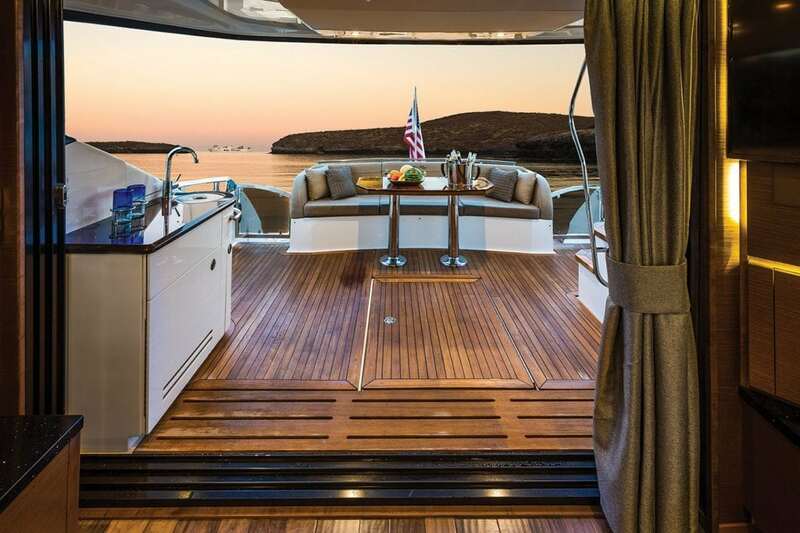 A four-panel sliding door opens up to the salon, and Sea Ray’s design team led by Tom Bucaccio created an open flow from the cockpit all the way through the salon to the helm station to starboard and galley to port. “One of the design elements of this boat is to integrate the salon and cockpit together,” Walker said. “There is a seamless transition without a high threshold for the salon door panels. A drainage trough is located in the cockpit sole to drain water overboard. The salon door panels stack to port creating a large opening.” The salon and the entire interior features walnut joinery and peppercorn inlays in areas such as the doors for a pleasant combination of textures. Leather pulls on cabinets and closets create a feeling of luxury yet are entirely useful. The salon layout starts with facing settees to port and starboard as you enter, with a two-seat bar to port amidships and a dining table and L-shaped settee to starboard. 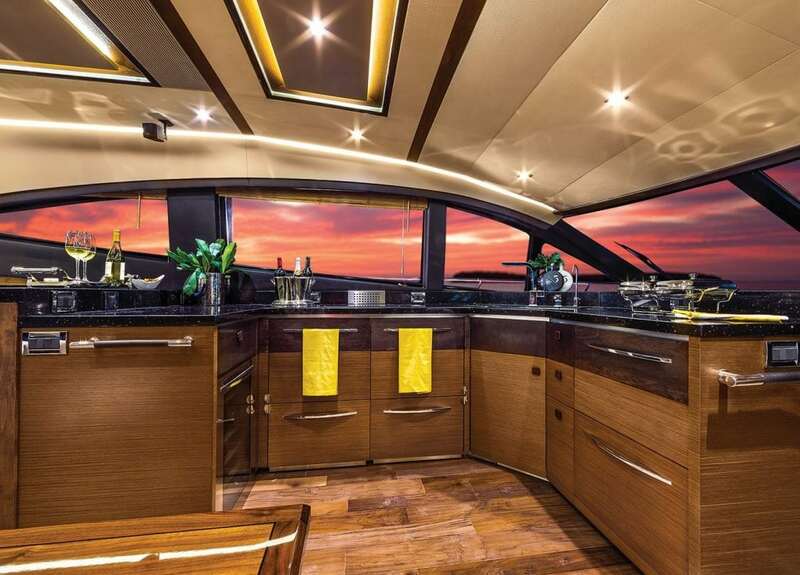 The fully stocked galley is to port opposite the lower helm station and features a sink, dual refrigerators/freezer, a wine cooler, and a unique pop-up storage area for your Sea Ray logo’d china. Natural light pours in from the large side windows. The L650 Fly’s lower deck is accessed from the salon deck by a seven-step staircase and aided by a leather-wrapped handrail, and the landing area is bright due to atrium windows that let in the sun. Previous Sea Ray models were somewhat enclosed in this area, and the design team wanted to break from that with the L650 Fly. 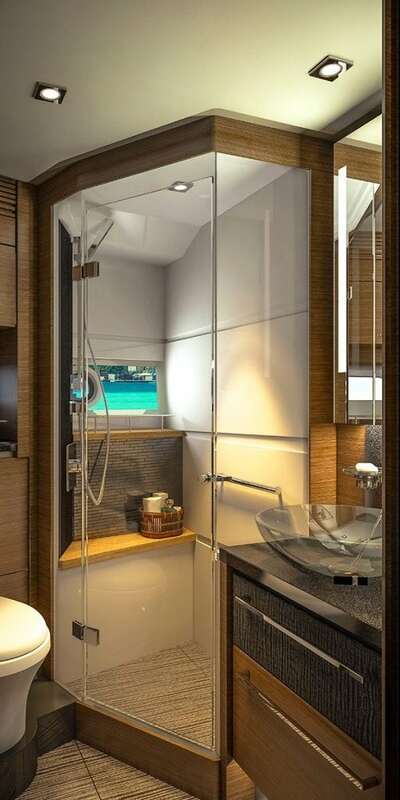 The lower deck features four staterooms and three heads. There is also a standard day head accessed from the swim platform for a total of four standard heads. 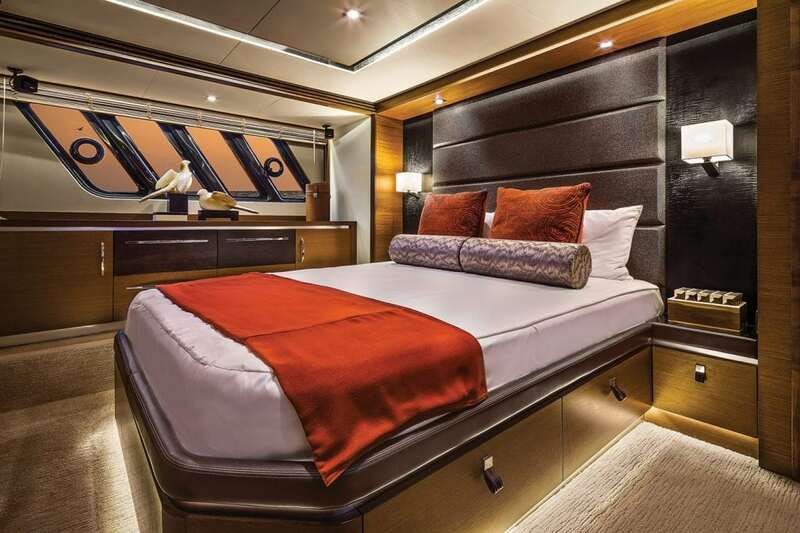 The VIP stateroom in the bow offers a queen berth with private head, and LED rope lighting—a skylight and large hull windows create an airy feel. 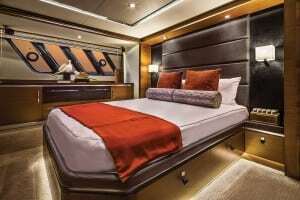 Staterooms to port and starboard each feature twin berths and share a dayhead—side windows connect guests to the sea and again, allow in plenty of light. 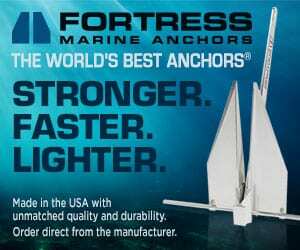 The full-beam queen master is located midship aft of the companionway. 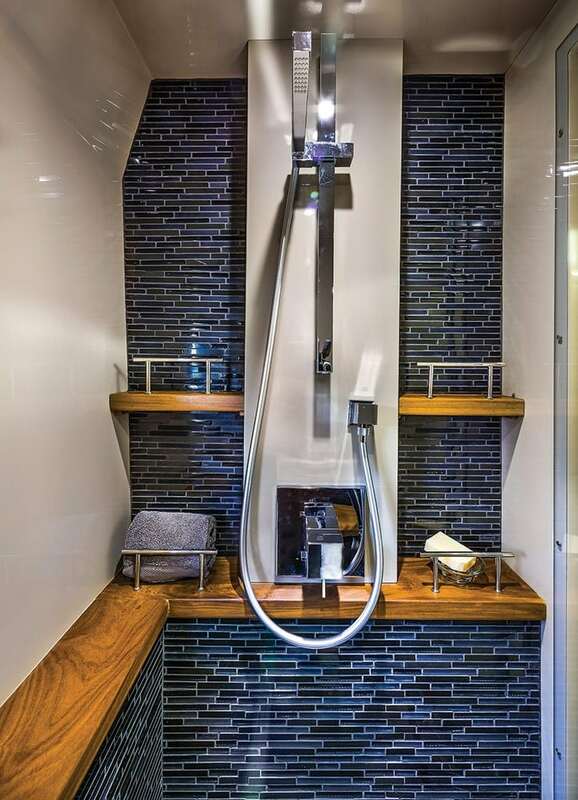 A large head offers dual sinks and a large rain-head type shower with more than 6 feet, 6 inches of headroom. 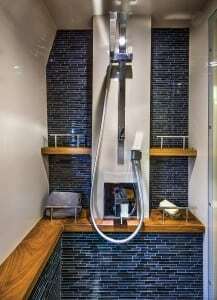 Mosaic tiles decorate all the heads and extend into the showers. Creating copious social zones was another goal of Sea Ray’s design team. The flybridge area is accessed via a port-side staircase and offers a variety of sunpad setups, couches and seats for relaxing. Covering the flybridge is a unique hardtop that can be configured for maximum or minimal shade—a telescoping sunshade deploys aft to offer cover for the aft seats. The foredeck bow area can be set up to be a huge sunpad or rearranged to offer a table and facing lounges. Whether you’re going to operate the boat on your own or hire a captain to do the hard work for you, Sea Ray’s L650 Fly is a prime example of how luxury, technology and old-fashioned marine seaworthiness are combined to provide ease of use and peace of mind.